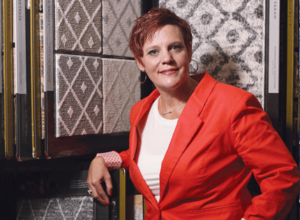 Dianne Grossman experienced her “life-changing aha moment” while flipping through a trade magazine called Floor Covering Weekly. There it was…a most startling statistic: “80% of flooring is purchased by women, yet 80% of flooring is sold by men.” She was…well…floored by the disconnect. “That’s a huge missing piece in the industry,” she says. Thus the seed was planted for The Carpet Girl, LLC, her 3-year-old flooring project management business, based in Springfield, featuring women sales consultants who make house calls. “Our goals are to teach women to become the authority in the flooring industry and to change how people purchase floor covering in a positive way,” says Dianne, first-prize winner of UCEDC’s Quick Pitch Competition sponsored by Capital One Bank. The competition is designed to give fledgling entrepreneurs a chance to hone their business ideas with the help of experts from the bank. Initially, the venture was more of a sideline endeavor to help her husband Seth, who has 27+ years’ experience in the flooring business. He was looking to grow sales at the company where he was working at the time and where Diane was helping out. She already had been casually advising friends on carpeting purchases and showing them samples at the workplace showroom; she simply took it a step further. Seth was skeptical about the long-term prospects and even Dianne wasn’t prepared for how fast it took off. For year 1 she set a goal of $100,000 in sales; within the first 9 months they had already topped $150,000! It wasn’t long before Seth joined as her full-time partner. 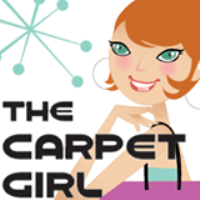 The concept of in-home sales isn’t unprecedented, but Dianne believes that the quality and range of manufacturers/products that The Carpet Girl offers plus the female approach distinguish her business from what’s already out there. “The traditional ‘shop at home’ business model focuses mostly on middle- to lower-end products, which limits customers’ choices. We offer middle- to upper-end products and bring name brands that aren’t typically available through existing flooring/carpeting shop-at-home services,” she explains. The in-home sales team is composed of woman consultants (the “carpet girls”) who work independently according to their own schedules—“Sort of like Mary Kay for carpeting and flooring,” says Dianne. She and Seth train the consultants on all aspects of the products and the company provides all the “back office” support including the products, delivery and, if needed, referral to one of their trusted, vetted installers. Dianne and Seth started out working from home, but now they have offices and a showroom in Springfield with 4 full-time “carpet girl” sales staff. They envision up to 10 showrooms throughout New Jersey and parts of Pennsylvania, with the next in Morristown, and plan on hiring more full- and part-time staff. Meanwhile, they’re always looking to recruit more in-home consultants. Seth’s experience and connections in the industry have helped tremendously. Dianne, a Georgia native with a cheery, friendly manner, puts people at ease quickly, which is always a plus when you’re in sales. She also credits her varied career background—travel agent, human resources recruiter, child daycare provider for example—with contributing to the management, problem-solving, human relations and other skills she now draws on. One thing neither she nor Seth knew much about, however, was owning their own business. That shortcoming became particularly apparent, she says, after they incorporated as a limited liability company (LLC) without understanding all of the financial and other implications. Instructors Erich Peter and Meryl Layton (who she still emails weekly) encouraged Dianne and Seth to apply for the Quick Pitch Competition, which is open only to “Entrepreneurship 101” graduates. Contestants are expected to deliver a 5-minute pitch about their business plan to a panel of judges, after they have worked with a mentor from Capital One Bank to prepare. Capital One provided the first-place prize of $2,000 (second place received $600 and the remaining participants got $200 each). Dianne and Seth hadn’t taken a real vacation since starting their business, and Dianne hadn’t been back to visit her family in Georgia for even longer. So they applied their winnings to an extended trip south for the holidays, heeding the adage that you can’t take care of business without taking care of yourself.